Son, brother, husband, father … I’m all those things. But, who am I? I am a man who is defined by my faith. My faith compels me and moves me forward. It shapes me and defines me. I follow Christ but I refuse the label “Christian” because of what it has become. I am not a shouter, picketer, political man who judges others based on a standard I cannot attain. I just do my best to follow Christ and try to live like he lived. My goal is to love God and love others. Simple. I’ll leave the judging to God. I pray a lot, fail often and have no stones to throw. I am a laugher. I love to laugh and make others laugh. I laugh at myself and will play the fool if it will put a smile on others’ faces. I’m a crier. My family laughs at me because of how often tears fill my eyes – cheesy Hallmark movies, underdog victories, veterans – I’m a softy. I usually cry a happy tear or two at every wedding I shoot. I’m a lover. I love people. I love life. I love my 1o pound dog. I love my family and adore my wife of now close to 33 years. I’m a giver. I enjoy helping wherever I can. I love using my photographic skills to come alongside non-profits making a difference in people’s lives. Volunteering brings me fulfillment. I’m a liver. Tomorrow is not guaranteed. Life is to be lived. I love to explore, try new things, take risks and learn new things. I’m a survivor. On May 7, 2012, my son Joshua lay on a surgeon’s table to save my life by giving me 55% of his liver. Because of that gift I am alive and thriving today. I am a big supporter of organ donation and hope you are registered. 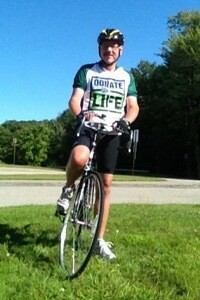 Register now at www.donatelife.net. My love for photography began when I was about 13 years old and got a 110mm camera as a gift. My mother encouraged my efforts and said that I had a natural eye for the craft. By the time I entered high school I had saved enough pennies to buy a fully manual Minolta 35mm camera and handheld light meter. My high school had an excellent graphics tech school with a fully equipped darkroom and print shop. My hunger for improvement had me reading everything I could find and joining a local photo club. By my senior year (1981), I had shot several portraits, two weddings and did publicity shots for a couple local bands. In addition to shooting for the yearbook and school paper, I also had photos published in the Lewiston Sun Journal. In 1981 I began my journalism studies at the University of Maine in Orono. During my years at Orono I took every photojournalism and photography course offered, enjoyed hours in the campus darkrooms and served a semester as Photo Editor for the Daily Maine Campus newspaper before switching to a news/editorial focus. I followed up my photojournalism training with photo courses in the art department at the University of Southern Maine from 1985-1987. It was at UMaine where I met and married my wife, Robin. In 2003 I made the plunge into the world of digital photography with a Panasonic DSLRe. I loved the instant results but was frustrated by low-end digital issues of shutter lag and limited ISO settings. Shooting sports events was very frustrating since my DSLR could not compare to my 35mm equipment shooting 7 frames per second. Next I tried a Nikon D70 but still could not capture good action shots with only three frames per second. That led me into the professional DSLR ranks with a Nikon D1H. In this digital age where hundreds of people are buying cameras and then advertising themselves as professionals, I am a trained photographer who has been active in the craft for more than 30 years. I understand photography, lighting and have thousands of hours of experience dating back to making my own prints in darkrooms. My education, with a degree in journalism and the complete offerings of the University of Maine photography courses, shows itself in my work. I add the photojournalistic to the artistic to tell your story in creative ways.